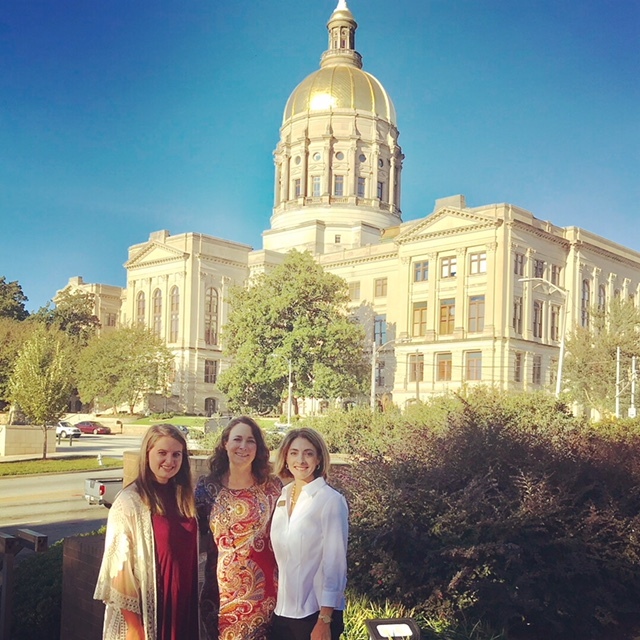 This past Friday I had the opportunity to go once again to the Georgia Department of Education and represent teachers on the State Superintendent’s Teacher Advisory Council. Basically, this is a gathering of approximately 75 K-12 teachers from Georgia who hear directly from Richard Woods, our state superintendent, then spend time discussing issues that are important and pressing in education today. An added plus for the day for me was spending time with my fun friend Martha Milam and Carleigh Myatt, student-teacher extraordinaire. I asked my students if they had any concerns I should share with Mr. Woods. Their reply – dress code. When I told them that this was not really the focus of our meeting, a few mentioned standardized testing (I told them I had already covered this which is what got me on the council) and one saw me after class to ask me to privately express his concern about Betsy DeVoss (insert crying laugh here). One of his goals when he ran was for the DOE departments to not work in isolation but rather work together; this seems like a no-brainer but is actually much harder to do than say. I have witnessed departments such as assessment, curriculum, and government policy become more streamlined in their materials for teachers. The departments have coalesced (vocabulary word this week) and are working more efficiently. He also talked about how the state has submitted Georgia’s ESSA plan (Every Student Succeeds Act) to the USED and are awaiting approval on it. I have read this plan and like the direction it takes. When the advisory council met last spring, we gave input on this plan. Woods claims this is not a perfect plan but will allow districts the flexibility to plan what’s best for them. Woods noted that Georgia saw a rise in SAT/ACT scores this past year while the nationwide average was down. He also mentioned several innovative projects taking place in schools across the state; it’s exciting to hear about cutting-edge opportunities for our students like this one in Coweta County. Yeah, Georgia! One of the things that was most exciting to me was hearing Woods talk about what the future of the diploma will look like in Georgia. He says that he is “not interested in protecting the brand of the diploma but rather protecting the brand of students.” Students should have options and not all be on one track. He told about a school teaching a personal finance class and the ability this class has to change someone’s life. Woods noted that at least half of marriages end in divorce, many due to communication issues and financial difficulties. Perhaps a course in learning how to manage money cannot only fulfill a high school graduation requirement but help someone have a better marriage. He then said, “If we are ever going to see a change in education, we will have to see the family restored.” We can do a lot in the classroom. Sometimes I spend more time with my students than their parents do each day because they are in my room for 90 minutes. I definitely know more about some teens than their parents do. BUT I can never replace a parent. I can stand in the gap when needed, but the gap not filled – just bridged. Education begins in the home. Standardized testing has been reduced in the last couple of years; this is a good sign. Local districts have a lot of flexibility in how they choose to run their schools; this is also good. There are problems that still need fixing – continued reduction of standardized testing, the current teacher evaluation system, and teacher recruitment and retention to name a few. Sometimes these things discourage me while other times I go days without thinking about our plaguing problems. Bottom line: I like Richard Woods and what he is doing for teachers and education in the state of Georgia. I think the people who lead us at the state level have students’ best interest in mind. Most of my colleagues have students’ best interest in mind. No matter what level of education you’re involved in, keep asking: Am I doing what is in the best interest of students. This will keep us on track. Now if we can only get legislators working with us . . . . . .